Singapore’s AnAn Group said on Monday it was seeking legal advice after receiving a claim from Russia’s VTB Bank to repay $170.4 million in relation to the purchase of shares in En+ Group last year. With National Day coming up next Thursday, organisations are pulling out the stops to provide local entertainment on Singapore’s 53rd birthday. Foreign Minister Vivian Balakrishnan said he is confident that Singapore and Malaysia can work closely together to strengthen bilateral ties and regional cooperation, after meeting his Malaysian counterpart Saifuddin Abdullah yesterday. A group of National University of Singapore (NUS) students were watching the sunrise on a beach in Lombok when they suddenly felt the earth move. A former student’s bid to get her master’s degree via a court order failed after a judge found the National University of Singapore (NUS) was justified in refusing her the degree. Last Saturday’s gathering to discuss a new opposition coalition led by former People’s Action Party (PAP) MP Tan Cheng Bock was a few years in the making. 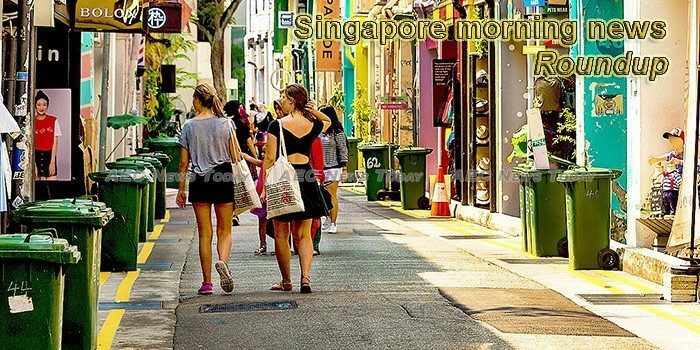 Singaporeans continue to view family as the most important personal value, even as more are taking humour and fun seriously, a survey has found. Up to 4,000 withdrawals totalling more than S$40 million were made by Central Provident Fund (CPF) members aged 55 and above, in the three months since a digital payment option was made available. Twenty sets of airsoft guns and parts were seized by the Immigration and Checkpoints Authority (ICA) on July 24. The personal particulars of 1.5 million patients were stolen in Singapore’s worst cyber attack. Last Thursday, property developer Tee Land called off a S$60 million en bloc deal for Teck Guan Ville condo – the first such instance since the announcement of fresh property curbs earlier this month. When Ms Chew Khee Gek went to school for the first time, she was 11 years old and by far the oldest child in her Primary 1 class. Canadian Foreign Minister Chrystia Freeland is scheduled to leave Canada on Tuesday for a meeting of ASEAN foreign ministers in Singapore, the Canadian foreign ministry said. With the ASEAN meetings running from July 30-Aug. 4, it is unlikely Freeland would make it to Washington for the Thursday talks. Chart of the Day: How much of Singapore’s re-exports go to China and US? This chart from CEIC showed that Singapore’s re-exports in 2017 are widely exposed to the trade wars as 13.6% of its re-exports goes to China whilst 6.1% goes to the US. Pompeo said he will visit Malaysia, Singapore and Indonesia this week, where he planned to announce new security assistance. In another move by a bank here to carve a place for itself in the e-commerce space, United Overseas Bank (UOB) is partnering with online consumer marketplace Carousell, as well as seven car dealers, to offer a digital car-financing service for consumers. As a community of students concerned with political literacy and civic engagement, CAPE is disappointed with the comments made by the Vice Principal (VP) of Saint Joseph’s Institution (SJI) Mr Leonard Tan on the role and relevance of activism. In an article published by The Straits Times earlier this month, Finance Minister Heng Swee Keat was quoted as saying that “Singapore is positioned to support the region’s development by financing infrastructure and enterprise in Asia, including bringing in private capital”. CIVICUS, the global civil society alliance and its partners Asia Democracy Network (ADN), Asian Human Rights Commission (AHRC), Forum Asia, Instituto de Comunicación y Desarrollo (ICD), West African Human Rights Defenders Network, Experts for Security and Global Affairs Association, Balkan Civil Society Development Network (BCSDN), European Civic Forum (ECF) and International Partnership for Human Rights (IPHR) call on the Singapore government to drop contempt charges against human rights activist, Jolovan Wham for his comments on social media criticizing the judiciary. e-commerce enabler Synagie Corporation (Synagie) launched its initial public offering (IPO) of 43 million shares 27 cents each for its listing on the Catalist Board of the Singapore Exchange Securities Trading Limited (SGX-ST). The Durian Festival organised by the Sengkang Community Club and endorsed by MP Teo Ser Luck took a sour turn on Sunday (29th July) as they realised they didn’t have enough durians for the amount of tickets that were sold. Shopping centres are shifting their strategy, turning to activity-based and F&B retailers to keep customers coming even as they remain under siege by e-commerce. After a night of working on her final year project, the 24-year-old National University of Singapore (NUS) student was taking a nap in the computer laboratory with her boyfriend when she was molested. An off-duty Singapore Armed Forces (SAF) regular serviceman from the SAF Medical Training Institute was found dead on Saturday (28 July).